Gorshkov G.S., Dubik Y.M. Gigantic directed blast at Shiveluch volcano (Kamchatka) // Bulletin Volcanologique. 1970. V. 34. P. 261-288. Since Bezymianny Volcano resumed its activity in 1956, eruptions have been frequent; recently with up to 1–2 explosive events per year. To investigate deformation related to this activity we installed a GPS network of 8 continuous and 6 campaign stations around Bezymianny. The two striking observations for 2005–2010 are (1) rapid and continuous network-wide subsidence between 8 and 12 mm/yr, which appears to affect KAMNET stations more than 40 km away where we observe 4–5 mm/yr of subsidence, and (2) only the summit station BZ09 shows slight deviations from the average motion in the north component at times of eruptions. The network-wide subsidence cannot be explained by tectonic deformation related to the build-up of interseismic strain due to subduction of the Pacific plate. 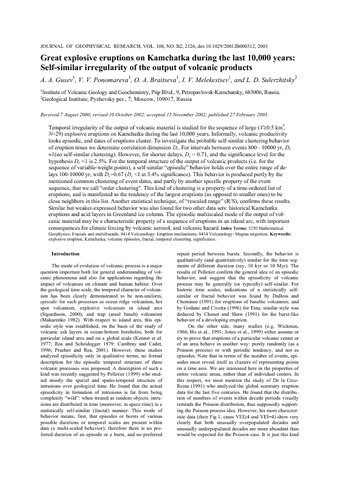 A first order model of surface loading by eruptive products of the Kluchevskoy Group of Volcanoes also explains only a fraction of the subsidence. However, a deep sill at about 30 km under Kluchevskoy that constantly discharges material fits our observations well. The sill is constrained by deep seismicity which suggests 9.5 km width, 12.7 km length, and a 13° dip-angle to the south-east. We infer a closing rate of 0.22 m/yr, which implies a volume loss of 0.027 km3/yr (0.16 m/yr and 0.019 km3/yr considering surface loading). Additional stations in the near and far field are required to uniquely resolve the spatial extent and likely partitioning of this source. We explain the eruption related deformation at BZ09 with a very shallow reservoir, likely within Bezymianny's edifice at a depth between 0.25 km and 1.5 km with a volume change of 1–4 × 10− 4 km3. Much of the material erupted at Bezymianny may be sourced from deeper mid-crustal reservoirs with co-eruptive volume changes at or below the detection limit of the GPS network. Installation of more sensitive instruments such as tiltmeters would allow resolving of subtle co-eruptive motion. 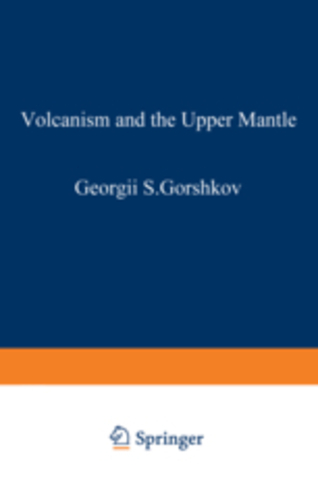 Gurenko A., Belousov A., Kamenetsky V., Zelenski M. Origin of volatiles emitted by Plinian basaltic eruptions of Chikurachki volcano, Kurile arc, Russia: trace element, boron and sulphur isotope constraints // Chemical Geology. 2018. № 478. P. 131-147. Gurenko A.A., Belousov A.B., Trumbull R.B., Sobolev A.V. 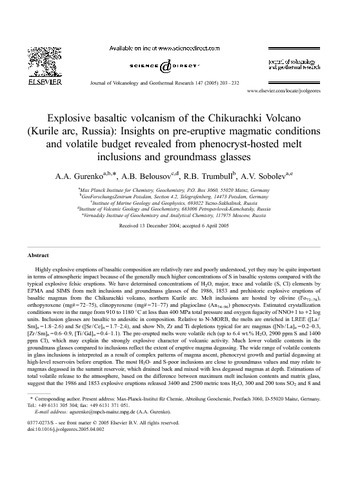 Explosive basaltic volcanism of the Chikurachki Volcano (Kurile arc, Russia): Insights on pre-eruptive magmatic conditions and volatile budget revealed from phenocryst-hosted melt inclusions and groundmass glasses // Journal of Volcanology and Geothermal Research. 2005. V. 147. № 3-4. P. 203-232. doi:10.1016/j.jvolgeores.2005.04.002. Temporal irregularity of the output of volcanic material is studied for the sequence of large (V ≥ 0.5 km3, N = 29) explosive eruptions on Kamchatka during the last 10,000 years. Informally, volcanic productivity looks episodic, and dates of eruptions cluster. To investigate the probable self-similar clustering behavior of eruption times, we determine correlation dimension Dc. For intervals between events 800 and 10,000 years, Dc ≈ 1 (no self-similar clustering). However, for shorter delays, Dc = 0.71, and the significance level for the hypothesis Dc < 1 is 2.5%. For the temporal structure of the output of volcanic products (i.e., for the sequence of variable-weight points), a self-similar “episodic” behavior holds over the entire range of delays 100–10,000 years, with Dc = 0.67 (Dc < 1 at 3.4% significance). This behavior is produced partly by the mentioned common clustering of event dates, and partly by another specific property of the event sequence, that we call “order clustering”. This kind of clustering is a property of a time-ordered list of eruptions, and is manifested as the tendency of the largest eruptions (as opposed to smaller ones) to be close neighbors in this list. Another statistical technique, of “rescaled range” (R/S), confirms these results. Similar but weaker-expressed behavior was also found for two other data sets: historical Kamchatka eruptions and acid layers in Greenland ice column. The episodic multiscaled mode of the output of volcanic material may be a characteristic property of a sequence of eruptions in an island arc, with important consequences for climate forcing by volcanic aerosol, and volcanic hazard. A tephrostratigraphic and petrological study of the Chikurachki (1816 m)-Tatarinov-Lomonosov volcanic chain (CTL volcanic chain) and Fuss (1772 m), located at the southern part of Paramushir Island in the northern Kurile Islands, was carried out to reveal the explosive eruption history during the Holocene and the temporal change of the magma systems of these active volcanoes. Tephra successions were described at 54 sites, and more than 20 major eruptive units were identified, consisting of pumice fall, scoria fall and ash fall deposits, each of which are separated by paleosol or peat layers. The source volcano of each recognized tephra layer was confirmed by correlation with proximal deposits of each eruption center with respect to petrography and whole-rock and glass chemistry. The age of each layer was determined by radiocarbon dating and the stratigraphic relationship with the dated, widespread tephra from Kamchatka according to the thickness of paleosols bracketed between tephra layers. The Holocene activity in this region was initiated by eruptions from the Tatarinov and Lomonosov volcanoes. After the eruptions, the Fuss and Chikurachki volcanoes started their explosive activities at ca. 7.5 ka BP, soon after the deposition of widespread tephra from the Kurile Lake caldera in southern Kamchatka. Compared with Fuss located on the back-arc side, Chikurachki has frequent, repeated explosive and voluminous eruptions. Whole-rock compositions of the rocks of the CTL volcanic chain and Fuss are classified into medium-K and high-K groups, respectively. These suggest that magma systems beneath the CTL volcanic chain and Fuss differ from each other and have been independently constructed. 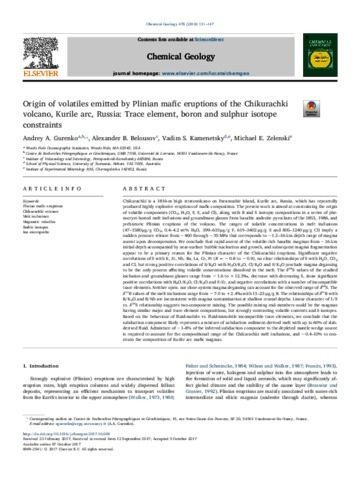 The rocks of the Chikurachki volcano are basalt-basaltic andesite and have gradually evolved their chemical compositions; when graphed on a SiO2-oxide diagram, these form smooth trends from mafic to more felsic. This suggests that the magma system evolved mainly by fractional crystallization. In contrast, matrix glass chemistries for Fuss pumices are distinct for each eruption and show different K2O levels on a SiO2-K2O diagram. This implies that the magma system of Fuss has been frequently replaced. Both volcanoes have been active under the same subduction system. However, the Chikurachki volcano will continue eruptive activity under a stable magma system with a higher magma discharge rate, whereas Fuss may continue construction with an intermittent supply of distinct, small magma batches. Fossil diatom assemblages in a sediment core from a small lake in Central Kamchatka (Russia) were used to reconstruct palaeoenvironmental conditions of the late Holocene. The waterbody may be a kettle lake that formed on a moraine of the Two-Yurts Lake Valley, located on the eastern slope of the Central Kamchatka Mountain Chain. At present, it is a seepage lake with no surficial outflow. Fossil diatom assemblages show an almost constant ratio between planktonic and periphytic forms throughout the record. Downcore variations in the relative abundances of diatom species enabled division of the core into four diatom assemblage zones, mainly related to changes in abundances of Aulacoseira subarctica, Stephanodiscus minutulus, and Discostella pseudostelligera and several benthic species. Associated variations in the composition and content of organic matter are consistent with the diatom stratigraphy. The oldest recovered sediments date to about 3220 BC. They lie below a sedimentation hiatus and likely include reworked deposits from nearby Two-Yurts Lake. The initial lake stage between 870 and 400 BC was characterized by acidic shallow-water conditions. Between 400 BC and AD 1400, lacustrine conditions were established, with highest contributions from planktonic diatoms. The interval between AD 1400 and 1900 might reflect summer cooling during the Little Ice Age, indicated by diatoms that prefer strong turbulence, nutrient recycling and cooler summer conditions. The timing of palaeolimnological changes generally fits the pattern of neoglacial cooling during the late Holocene on Kamchatka and in the neighbouring Sea of Okhotsk, mainly driven by the prevailing modes of regional atmospheric circulation.